24 hr towing, auto repair and detailing, call today (567) 351-6168 for a quick quote. Serving Ashland and Richland Counties and surrounding areas. - We provide service through most insurance and roadside companies. - Service usually arrives within 45 minutes or less, depending on location. - Most credit cards accepted. - Fixed Rates, no hidden fees. Our 5 truck fleet to handle all of your needs. 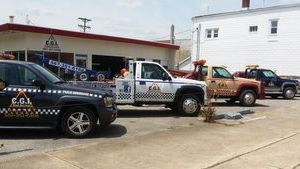 3 tow trucks 1 service truck and 1 battery installation truck.